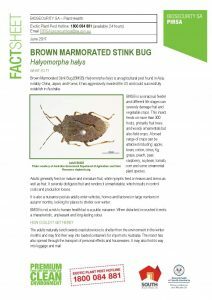 The brown marmorated stink bug (Halyomorpha halys), is one of Australia’s top 40 priority plant pests and needs to be kept out of Australia. It has the potential to severely impact our agriculture industries. 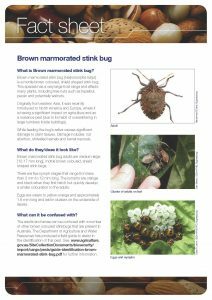 It is a mottle brown coloured shield-shaped stink bug (adults 12-17mm long) which looks quite similar to many Australian native stink bugs. The BMSB however has distinctive black and white banding around the outer edge of the abdomen, and white bands on the last two antennal segments. Juveniles and adults feed on, and can severely damage vegetable crops and fruit, including grapes. Damage to grapes further predisposes them to secondary infection, thus impacting quality and yield. Additionally, if BMSB’s are present in grape bunches when processed through the winery, compounds may be released from the stink bugs that can impact wine quality. Click here for a scientific paper published in 2018 on implications for winemaking. The BMBS is also a nuisance pest as adults enter vehicles, homes and factories in large numbers in autumn months, looking for places to shelter and over winter. BMSB can arrive in Australia on cargo and containers between September and April, coinciding with late autumn and winter in the Northern Hemisphere. The wine industry, we are seeking particular heightened vigilance with any shipments of timber for barrel making or entire barrels being received from North America, Europe or Asia. 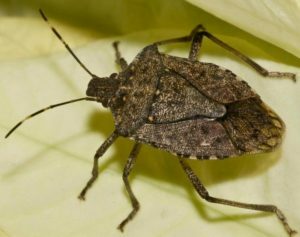 The Department of Agriculture and Water Resources (DAWR) has introduced measures to manage the risk of brown marmorated stink bugs during the high risk season for these pests. Click here for DAWRs ‘Seasonal measures for BMSB’. If you see any unusual pest in a shipping container or international consignment when receiving, unpacking or using the items, secure the goods to limit the movement of any animals or insects and immediately report it to the Exotic Plant Pest Hotline on 1800 084 881. 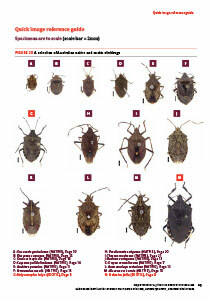 Refer to the Quick Reference Guide for identifying features of the Brown Marmorated Stink Bug (G) compared to other Native Stink Bugs. 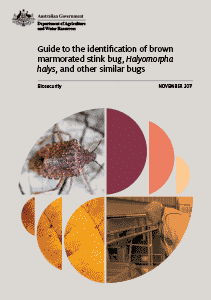 Refer to Brown Marmorated Stink Bug Factsheets by PHA and Biosecurity SA, for help in identifying the insect. Think stinkbugs can’t be that bad?